There’s a lot to consider when choosing a boiler for your property, including cost, size, type of property, longevity, and most importantly efficiency as it helps to lower the ever-increasing energy costs. Every property has different heating requirements; luckily, there are several types of boilers in the market to fit every heating need. This is basically an old school version of a system boiler. Also known as regular, traditional, or open vent boilers, this heating system is made up of several parts, including a cylinder, two water storage cisterns (one that draws cold water from the main supply while the other feeds the boiler system), a boiler, and heating controls. 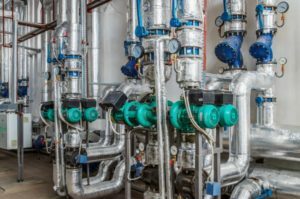 Although it occupies a lot of space, a conventional boiler can supply large volumes of hot water to multiple rooms at once, making them the ideal commercial boilers for larger properties. These boilers are compatible with solar thermal systems, which can help reduce footprint and energy bills. This unit is, however, suited to properties with traditional heating systems. Combination or ‘combi’ boilers directly heat water from the mains, eliminating the need for a water cylinder and tanks. It acts as both a central heating supply and a water heater, which is where the name combi comes from. This heating system is by far the most popular choice within the UK as it’s considered energy-efficient, Eco-friendly, and cost-effective. Also, hot water is delivered at mains pressure, which allows you to enjoy a hot and powerful shower without needing a separate shower pump. They are available in both electric and gas. They are also compact, making them ideal for smaller properties. System boilers (sealed system boilers) offer a middle ground between conventional and combination boilers. Most of their components are actually built in, including the pump and the expansion vessel, eliminating the need for tanks. They, however, do require a hot water storage cylinder. System boilers take up less space compared to conventional boilers and still allows for multiple hot water uses, which isn’t offered by combination boilers. This makes them the ideal commercial boilers for larger properties with high hot water demand running at once but has minimal space for installation. System boilers are also compatible with solar thermal systems, offering an energy-efficient option. The best boiler for your property is one that suits both your short and long term demands. ST Heating Services Ltd is your go-to Company when you need commercial and industrial gas engineers in Manchester and throughout the North West, UK. Our registered and experienced contractors offer high-quality heating services, including installation, repair, maintenance, as well as heating & plumbing servicing, ensuring our clients get the most efficient boiler for their needs. For more information, contact us today!